Intermodal freight transport involves the transportation of freight in an intermodal container or vehicle, using multiple modes of transportation (rail, ship, and truck), without any handling of the freight itself when changing modes. The method reduces cargo handling, and so improves security, reduces damages and losses, and allows freight to be transported faster. Reduced costs versus over road trucking is the key benefit for intracontinental use. The negative is that it takes longer than normal truck delivery would. Containers, also known as intermodal containers or ISO containers because the dimensions have been defined by ISO, are the main type of equipment used in intermodal transport, particularly when one of the modes of transportation is by ship. Containers are 8-foot (2.4 m) wide by 8-foot (2.4 m) high. Since introduction, there have been moves to adopt other heights, such as 8-foot-6-inch (2.59 m), 9-foot-6-inch (2.90 m) and 10-foot-6-inch (3.20 m). The most common lengths are 20 feet (6.1 m) nominal or 19 feet (5.8 m) – 10+1⁄2 in (0.27 m) actual, 40 feet (12 m), 48 feet (15 m) and 53 feet (16 m), although other lengths exist. They are made of steel and can be stacked atop one another (a popular term for a two-high stack is “double stack”). Onboard ships they are typically stacked up to seven units high. They can be carried by truck, rail, container ship, or aeroplane. When carried by rail, containers can be loaded on flatcars or in container well cars. In Europe, stricter railway height restrictions (smaller loading gauge and structure gauge) and overhead electrification prevent containers from being stacked two high, and containers are hauled one high either on standard flatcars or other railroad cars. Taller containers are often carried in well cars (not stacked) on older European railway routes where the loading gauge is particularly small. Some variations on the standard container exist. Open-topped versions covered by a fabric curtain are used to transport larger loads. A container called a tanktainer, with a tank inside a standard container frame, carries liquids. Refrigerated containers are used for perishables. There is also the swap body, which is typically used for road and rail transport. Built too lightly to be stacked, they have folding legs under their frame so that they can be moved between trucks without using a crane. Various non-standard container forms are commonly used. These include non-stackable open box containers, and several slightly non-standard geometries. European containers are often about two inches wider than the ISO standard although otherwise conformant, which can carry the euro-pallet standard pallet load. Specialised containers used in Europe include containerised coal carriers, and recently “bin-liners” – containers designed for the efficient road/rail transportation of rubbish from cities to recycling and dump sites. In countries where the loading gauge is sufficient, truck trailers are often used for freight that is transported primarily by road and rail. Typically, regular semi-trailers can be used, and do not need to be specially designed. An intermodal container or freight container (commonly shipping container) is a reusable transport and storage unit for moving products and raw materials between locations or countries; the terms container or box may be used on their own within the context of shipping. Containers manufactured to ISO specifications may be referred to as ISO containers and the term high-cube container is used for units that are taller than normal. There are approximately seventeen million intermodal containers in the world and a large proportion of the world’s long distance freight generated by international trade is transported inside shipping containers (as opposed to break bulk cargo). The containerization system developed from a design of an 8-foot (2.438 m) cube units used by the United States’ military and later standardised by extension to 10-foot (3.05 m), 20-foot (6.10 m), and 40-foot (12.19 m) lengths. Longer, higher and wider variants are now in general use in various places. Container variants are available for many different cargo types. Non-container methods of transport include bulk cargo, break bulk cargo and tankers/oil tankers used for liquids. For air freight the alternative and lighter IATA defined Unit Load Device is used. A typical container has doors fitted at one end, and is constructed of corrugated weathering steel. Containers were originally 8 feet (2.44 m) wide by 8 feet (2.44 m) high, and either a nominal 20 feet (6.10 m) or 40 feet (12.19 m) long. They could be stacked up to seven units high. Taller units have been introduced, including ‘hi-cube’ or ‘high-cube’ units at 9 feet 6 inches (2.90 m) and 10 feet 6 inches (3.20 m) high. The United States often uses longer units at 48 ft (14.63 m) and 53 ft (16.15 m). Some rare European containers are often about 2 inches wider at 2.5 m (8 ft 2.4 in) to accommodate Euro-pallets. Australian RACE containers are also slightly wider to accommodate Australia Standard Pallets. Lighter swap body units use the same mounting fixings as Intermodal containers, but have folding legs under their frame so that they can be moved between trucks without using a crane. Each container is allocated a standardized ISO 6346 reporting mark (ownership code), four characters long ending in either U, J or Z, followed by six numbers and a check digit. Container capacity is often expressed in twenty-foot equivalent units (TEU, or sometimes teu). An equivalent unit is a measure of containerized cargo capacity equal to one standard 20 ft (length) × 8 ft (width) container. As this is an approximate measure, the height of the box is not considered; for example, the 9 ft 6 in (2.90 m) high cube and the 4-foot-3-inch (1.30 m) half height 20-foot (6.10 m) containers are also called one TEU. Similarly, the 45 ft (13.72 m) containers are also commonly designated as two TEU, although they are 45 and not 40 feet (12.19 m) long. Two TEU are equivalent to one forty-foot equivalent unit (FEU). Variations on the standard container exist for use with different cargoes including Refrigerated container units for perishable goods, tanks in a frame for bulk liquids, open top units for top loading and collapsable versions. Containerised coal carriers, and ‘bin-liners’ (containers designed for the efficient road/rail transportation of rubbish from cities to recycling and dump sites) are used in Europe. The twenty-foot equivalent unit (often TEU or teu) is an inexact unit of cargo capacity often used to describe the capacity of container ships and container terminals. It is based on the volume of a 20-foot long intermodal container, a standard-sized metal box which can be easily transferred between different modes of transportation, such as ships, trains and trucks. One TEU represents the cargo capacity of a standard intermodal container, 20 feet (6.1 m) long and 8 feet (2.4 m) wide. There is a lack of standardisation in regards to height, ranging between 4.25 and 9.5 feet (1.30 and 2.9 m), with the most common height being 8.5 feet (2.6 m). Also, it is common to designate 45-foot (14 m) containers as 2 TEU, rather than 2.25 TEU. As noted above, the TEU is an inexact unit, and hence cannot be converted precisely into other units. The related unit forty-foot equivalent unit (often FEU or feu) however is defined as two TEU. The most common dimensions for a 20-foot (6.1 m) container are 20 feet (6.1 m) long, 8 feet (2.4 m) wide, and 8.5 feet (2.6 m) high, for a volume of 1,360 cubic feet (39 m3). However, both 9.5 feet (2.9 m) tall High cube and 4.25 feet (1.30 m) half height containers are also reckoned as 1 TEU. This gives a volume range of 680 cubic feet (19 m3) to 1,520 cubic feet (43 m3) for one TEU. While the TEU is not itself a measure of mass, some conclusions can be drawn about the maximum mass that a TEU can represent. The maximum gross mass for a 20-foot (6.1 m) dry cargo container is 24,000 kilograms (53,000 lb). Subtracting the tare mass of the container itself, the maximum amount of cargo per TEU is reduced to approximately 21,600 kilograms (48,000 lb). Similarly, the maximum gross mass for a 40-foot (12 m) dry cargo container (including the 9.5 feet (2.9 m) high cube container) is 30,480 kilograms (67,200 lb). After correcting for tare weight, this gives a cargo capacity of 26,500 kilograms (58,000 lb). 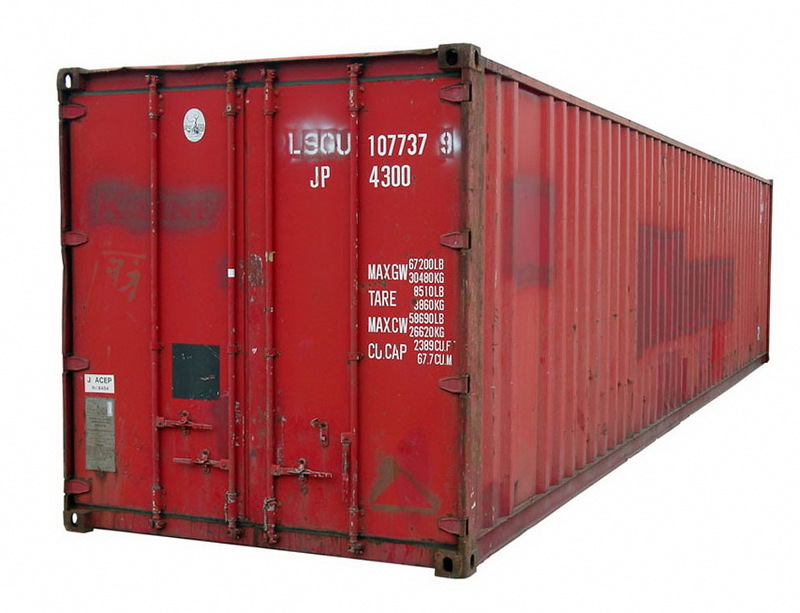 Twenty-foot, “heavy tested” containers are available for heavy goods such as heavy machinery. These containers allow a maximum weight of 67,200 pounds (30,500 kg), an empty weight of 5,290 pounds (2,400 kg), and a net load of 61,910 pounds (28,080 kg). There are five common standard lengths, 20-ft (6.1 m), 40-ft (12.2 m), 45-ft (13.7 m), 48-ft (14.6 m), and 53-ft (16.2 m). United States domestic standard containers are generally 48 ft (15 m) and 53-ft (rail and truck). Container capacity is often expressed in twenty-foot equivalent units (TEU, or sometimes teu). An equivalent unit is a measure of containerized cargo capacity equal to one standard 20 ft (length) × 8 ft (width) container. As this is an approximate measure, the height of the box is not considered, for instance the 9 ft 6 in (2.9 m) High cube and the 4-ft 3-in (1.3 m) half height 20 ft (6.1 m) containers are also called one TEU. The maximum gross mass for a 20 ft (6.1 m) dry cargo container is 24,000 kg, and for a 40-ft (including the 2.87 m (9 ft 6 in) high cube container), it is 30,480 kg. Allowing for the tare mass of the container, the maximum payload mass is therefore reduced to approximately 22,000 kg for 20 ft (6.1 m), and 27,000 kg for 40 ft (12 m) containers. The original choice of 8 foot height for ISO containers was made in part to suit a large proportion of railway tunnels, though some had to be deepened. With the arrival of even taller containers, further enlargement is proving necessary. In railroad terminology a Roadrailer or RoadRailer is a highway trailer, or semi-trailer, that is specially-equipped for use in railroad intermodal service. The advantage of using roadrailers is that due to their construction, the trailers can be pulled directly behind other freight (or even passenger) equipment without the use of trailer flatcars. Roadrailers first appeared on American railroads in the 1950s. The trailers were built with integrated railroad wheelsets that could be lowered into position when the trailer was pulled behind a train. More modern roadrailers do not include integrated railroad wheels, but ride on specially-manufactured bogies that do double-duty, serving as articulation points between multiple trailers in a train. Each truck is equipped with two fifth wheels and at one end (or both ends) of a convoy there is an adaptor truck equipped with one fifth wheel and one regular AAR Type “E” or Type “F” automatic coupler. Each semi-trailer has one king pin at each end. Because the bogie is significantly lighter than a rail flatcar or well-car, roadrailer freight trains are much lighter and therefore are more energy efficient than traditional intermodal trains. RoadRailers were built by the Bi-Modal Corporations in the early 1980’s located in West Chester Pennsylvania. The trailiers were built by the Budd Corporation locally with the integration of the wheelsets and railroad braking system done at the nearby Bi-Modal factory. This was a modern up-date of C&O’s Railvan used in the 1950’s. The railroad wheelsets attached to the aft portion of the trailer were lowed pneumatically by activating a simple valve controller on the left rear of the trailer. To transfer from highway mode to rail mode the trailer driver would position the trailer over tracks inlayed into a paved rail yard. First the operator would activate the valve to remove the air from the airbags that supported the trailer in the highway mode. In the fully lowered or squat position, hooks which held the railwheel set up above the road surface released. Then the operator would move the valve to inflate the two large airbags used for rail mode. These rail air bags were similar to those used in passenger rail cars at this time. After being fully transferred, the trailer would be fully level and ready for connection to the next trailer in the train. Throughout the early 1980’s various railroads experimented with the RoadRailer concept to determine if the equipment would be durable enough to endure railroad use. The positive attributes of the RoadRailer were its exceptionally smooth ride, light weight and low capital costs to set-up a rail yard. Since no flatcars were involved, no crane systems were needed to transfer the trailers between modes. In fact during one demonstration test a train of RoadRailers was broken down in the middle of an industrial street in Portland Oregon which happened to have track in the street demonstrating the flexibility of the system. Another note was that a RoadRailer train did not have a caboose car which at the time was still required for freight trains. A simple box was designed with a yellow strobe light designed to be installed in the unused coupler of the last car. Later, as cabooses were phased out, railroads today use a similar strobe to mark the end of the train. In 1982, Conrail operated a route between (Railports) Buffalo, Rochester and Highbridge New York in the Bronx called the Empire State Xpress operated by Bi-Modal subsidiary Road-Rail Transportation Company. The concept was to offer customers rapid freight service that would be competitive with traditional over the road service. Dedicated trains left Buffalo and Highbridge each evening arriving early the next morning. The line was eventually shut down after never establishing enough key customers to utilize the service. The primary reason that the original RoadRailer concept did not catch on was the weight penalty imposed on the trailers because of the attached railroad wheelset. This was resolved in later designs which removed the integrated wheelset by having a dedicated rail bogie assembly that stayed in the rail yard as seen today. When is it better to choose self storage over your own warehouse? What are the formers advantages over the latter? Or is it actually wiser to have your own warehouse rather than entrust your precious belongings to some self storage company? First and the most important of all is the sense of security that self storage provides as opposed to your own warehouse. With self storage, you are assured that you are keeping all of your items somewhere safe and secure, thus you are given peace of mind. How does self storage ensure security? For one, they require you to provide your own padlocks and keys to your storage units, so that only you will have an access to it. Apart from this, the storage facility also boasts of additional measures to ensure security, and that is by means of 24/7 surveillance cameras and security guards, pin numbers to access the electronic facility gates, flood-lighting at night, as well as high-technology burglar alarm systems. Contrast these state-of-the-art security systems versus the security afforded by mere padlocks in your own warehouse and you get a stark difference in favor of self storage. Next is the assurance of your items safety. In your own warehouse, you might not be able to do regular physical inspection because there is just so much to do at work, so you will never find out if your items are already being damaged by water, pests and rodents. In self storage, however, there are usually pest control programs which are being done regularly, as well as measures to prevent water damage or other natural calamities, if possible. Some storage facilities are even raised to higher levels just so damage can be avoided in cases of floods or typhoons. Another benefit afforded by self storage over your own warehouse is the availability of climate controlled units. You will not have to worry anymore about the temperature-sensitive items that you possess because you can set the temperature in some of the better self storage facilities, thereby avoiding damage to your precious items. True, you have to pay for certain fees, and transportation costs as well every time you access your storage unit, while when you store your goods in your warehouse, you do not have to pay for anything. What will make you decide for self storage, however, is the assurance of safety and security that it affords. You can have that in your own warehouse, but you will need to spend thousands upon thousands to provide a similar level of security, versus paying a certain tolerable amount of fees on self storage monthly. Self storage is, indeed, the way to go. Drew Mers is an advertising consultant to City Closet Self Storage, which rents inexpensive self storage throughout New York and New Jersey. When people need storage its usually because one of three things has happened; lack of space, seasonal needs, or more adequate storage needs have occurred. The solution to this problem is self storage units. Over recent decades self storage has taken on many forms and has adapted to different needs. This type of storage now covers five distinct groups of consumers who use storage for a multitude of needs. The Basics of Self Storage There are some common issues which are a part of any type of self storage. These issues must be looked into when using this type of storage. The contract – Contracts are different from one facility to another and from one storage type to another. The Hours – While some facilities are only open during business hours, others are 24/7 operations. Security Issues – Most outdoor storage uses a simple fence and passkey system with individual locks for units, while indoor storage makes use of cameras and sometimes personal security measures. Appropriate Uses – All storage facilities have clauses against storage of perishable food, pets, or combustible materials. Rates – Rental fees for storage can be paid weekly, monthly, quarterly or yearly. Shed Storage This is one of the two main types of self storage units available today. Usually these are made of metal and concrete. Most facilities allow you to drive right up to your unit. These units are good for such items as: Household furnishings Appliances Properly boxed clothing and books Warehouse Storage These units are constructed within the walls of a larger single building, are usually climate controlled and have sprinkler systems in place. Warehouse self storage is mainly used for the following: Document storage Storage of valuables or paintings Light or climate sensitive material Frozen items Trailer Storage This type of self storage is mainly used for quick storage of bulk or boxed items. Trailers are most likely used for: Vending route storage Tires or other non corrosive auto parts Pallets Multiple boxed or bagged items The Rented Garage The rented garage is the most common type seen in the newspaper where a vehicle is involved. Sometimes garages space is rented out for someone looking to park one of the following for a season or a year: RV or camper Antique autos Motorcycles Boats Lot Storage This type of self storage is used mainly for items which are too large to fit into an enclosed space or on a residential property. A variation of lot storage is a Marina or Boat Slip. Uses for lot storage are listed below: Large mobile homes Airplanes Boats Tractor trailers These are the five most common uses of self storage. Each type has its advantages and disadvantages depending on the requirements needed; while all provide one common service which is a place for people to put their stuff until needed later. Save money today by comparing rates from Self Storage locations to Moving Companies. Compare the convenience of storing seasonal items, special event materials and even documents in either Portable Storage Container Units for all your residential, business and corporate moves and needs. Getting a great deal on any acquisition always feels good. With self storage, getting the right size at the right location and right price are signs of having obtained a great deal. The question is: how does one actually get a great deal? Are there procedures that should be done to ensure great deals on self storage? The first thing to look for when choosing a self storage is always the location. Thus, getting a great deal means that you should have knowledge of all your possible self storage options in your area of preference, and you just select the best among them depending on the other variables for your choice, such as the price and the facility itself. There are many different ways by which you can find out about all the self storage facilities around the area. You can search for a self storage directory for your particular zip code over the internet or you can also try the yellow pages. Because self storage is one competitive business, there are, for certain, great deals that can work to your advantage. Great deals include bargains and sales on the self storage fees, which definitely help save money for other important needs. It would also be particularly helpful if you specify your preferred size and features of a self storage unit when inquiring, so you immediately learn from the self storage companies if they have those specifications available for you. Be very clear as to whether you want a small or a large, indoor or outdoor unit, and if there are any special amenities you want, such as climate control. The web is still the better option to learn about these things because of the details included in the websites, as opposed to paid advertisements in the yellow pages, flyers, newspapers and magazines. You do not have to call each of the self storage companies anymore after you have picked them out of the phonebook because all you need to know is stated already in their respective web pages. In some cases, they may even provide special discounts online, like a minimal or free of charge first month. Remember as well that there actually might be some self storage companies who pay you for each referral that you successfully make for the storage facility. This payment may be in the form of a big chunk cut out of your monthly rate in storage, or even some free months for storage. After selecting one self storage facility, it would be wise to ask if you can get any more discounts if you pay right then and there, or if you sign up with a long term lease. Many companies can actually reduce their monthly rates still, if you try to ask for one. In these companies, terms are often negotiable, so take advantage of it. A shipping container is a metal container that is used for shipping purposes. These containers come in a variance of sizes, and are able to be shipped worldwide. These shipping containers are normally waterproof in most cases, as well as airtight so that your goods are safe from the elements. There are prefixes that are used in the container numbers that are used to determine the carrier name. For example, the ACXU prefix is used in the number of and for the carrier name of Atlantic Cargo. So when tracking your shipping container online, make sure that you use the carrier prefix in your container number for proper verification. Shipping containers can be expensive to own, so many shipping tracker companies will offer you the option of leasing from a depot. There are 3 main depots: one in Denmark, one in England and one in Sweden. There are 18 companies that lease from Denmark, one in England and one in Sweden. Shipping containers come in many varieties, and it is in your best interest to choose the type or subtype that suits the goods you are shipping. Dry cargo containers come in lengths from 20 to 45 feet in length. They are available in high cube styles and regular dry cargo container styles. Reefer or refrigerated containers are common, and come in the same lengths as dry cargo containers. These also are offered in 40 and 45 foot high cubes as well. Insulated containers are offered in 20 and 40 foot lengths for those goods that require air tight or temperature controlled shipping. Open top containers are commonly used for goods that are not in danger of expiring due to the elements. These shipping containers come only in 20 and 40 foot lengths. Flat rack containers are available only in 20 and 40 foot lengths, and are offered with collapsible or flush folding sides. The tank shipping containers are only available in 20 foot lengths, and are used for liquids of all kinds purchased in bulk such as oil, milk or gasoline. All container measurements are normally exhibited as metric measurements when dealing with countries other than the United States. It is important to remember when tracking your shipping container, to include the detention or demurrage times. Detention is when the shipping container isn’t back at the depot in time from the consignee warehouse, while demurrage is when the container that is rented and stored is located with the goods inside the correct port. Some shipping lines will charge storage and electricity on top of demurrage. You can calculate the total demurrage or detention dates by using some website’s calculators. You would need the arrival date, the empty return date and the free days on the rental. You can choose to exclude certain days of the week, and this tool will then give you a total number of days for the detention or demurrage timeframe. Regardless of the shipping container your company uses, it is important to read through all of the information associated with that container’s owning company if rented or leased. There is always fine print that must be adhered to in order for continued use of the company to go on. Travel trailers have been in existence for some time. They have grown in popularity recently. They are units that towed behind vehicles such as RVs, SUVs, minivans, buses, and trucks. There are smaller units that towed by cars. Most manufacturers of travel trailers design the units for size, weight, and fuel economy. The sizes range from 10 to 26 feet length. The weight of the trailers range 400 to 2,000 pounds. People buying the travel trailers can purchase the right trailer based on their needs. The best thing about the trailers is the do not need gas to be enjoyed. They rely on the vehicle towing them for transportation to the different locations. They are designed to travel smoothly down the road behind the vehicles. For the traveler, the travel trailer is a great option for enjoying the life on the road. They provide the kitchen, bathroom, dining area, as well as an optional work area. The person who likes to travel will save money on the costs of the hotel accommodations since they can stay in the travel trailer on their trips. The people who purchase the trailer will have all the comforts of home while away from home. The trailers offer many of the amenities of home on the road making the traveling experience more pleasant as well as very affordable. They have found the life with the trailer to be an experience they enjoy immensely. The costs of the travel trailers are lower than the cost of buying a car. The option of buying either a new trailer or a used trailer is available also. Most new owners of travel trailers will purchase a used travel trailer that fits their budget. They will later trade the old trailer for a new once after getting to experience the life on the road with the older trailer. If you cannot find a travel trailer or rv that you are satisfied with at your local rv retailer, then check out sites like ebay. You may be able to get a travel trailer that is thirty to fifty percent off of what you would buy at your local rv store. This will save you a bundle, but unfortunately, you will not be able to see it until you actually receive it. That is a disadvantage if the trailer is in bad condition. So contact the seller and see if there is some way that a third party company can inspect the trailer and send the findings over to you. That would be enough to give you a peace of mind when getting your trailer. Ron tells people about RVs for sale and travel trailers for sale.